The Summer Vacation You and Your Family Should Take! Rent a car with SYNC and bring your music list (there are no music stations for 80% of the drive). Tip……bring “The Cello Song” by Steven Sharp Nelson and play it after you are 90 or so minutes out of Denver. It will feel as though the mountains are actually playing some of the most beautiful music choreographed to the most majestic scenery you can imagine just for you. When you get into Steamboat, you can’t help but notice how “Minnesota Nice” the locals are, even if they aren’t from Minnesota. There are so many things to do in the summer in Steamboat that you will have a hard time choosing which items get put on the vacation list. Hiking, fishing, biking, soaking in the hot springs, listening to a free concert, wandering through the art fairs, dining at the many establishments and shopping are a few of the things you will find to do. There are miles of hiking and biking trails. You’ll want to go with a buddy however because at Cimarron (the beautiful townhome I stayed in) we had fox daily and a bear interested in our trash 2 out of 4 nights. I had enough time after my morning appointments one day for two fun events. I decided to visit one of Mother Nature’s most remarkable gifts, the hot springs, and go horseback riding. Strawberry Hot Springs are fabulous. The drive there was beautiful and unlike in the winter, the “required by law” four wheel drive and chains were not in force. The springs are warm (just on the edge of hot actually), clean and friendly. No crowds like in winter, only 7 or 8 others were there. We had the pick of pools to bathe in and it was luxurious. The 65 degree air felt wonderful and I felt rejuvenated and was able to completely relax. A warm sunray, a trickling creek, a cooling breeze and now Steamboat hot springs are some of my favorite gifts from Mother Nature. This water amazed me. 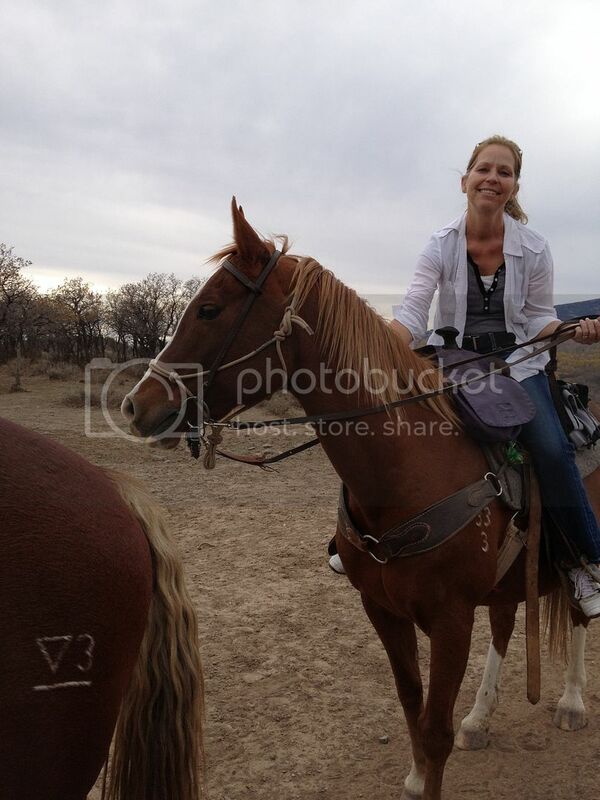 My second choice was to go horseback riding at Del’s Triangle 3 Ranch. Normally in winter there are a dozen horses following each other on this trail ride. That means you are stuck between two horses and at the mercy of others riding abilities. Going in the summer however I was gifted with a one on one horse trail ride in which we saw a family of five mule deer and a herd of 100 or more Elk. The elk were 200 yards away from us when I first noticed him. I say him because I only saw one HUGE buck and Michele (my guide) pointed out that the entire background was moving as well. It was a herd made up of female, male and young elk. They made a call that sounded like a bugle – it was lovely. When they caught wind of us they took off through the forest up the mountain. The thunder of their hooves and the cracking and snapping of all the dead, fallen timber was amazing. So my advice is to rent an awesome home, bring the entire family to Steamboat in the summer and have the time of your life hiking, biking, horseback riding, swimming, or whatever else your hearts desire. At least four of the locals I spoke with told me they came on a ski trip and never left. I learned what ended up to be a common phrase in Steamboat; ”you come for the skiing and stay for the summers”. I love to ski, I do, but I couldn’t imagine missing this place in the summertime. Next time I’ll go mid September as more of the leaves will be on the trees and I’m told the colors and scenery are even more remarkable (I can hardly imagine that). This is a hidden summer vacation oasis. Go to Steamboat in the summer, you will not be disappointed. By the way….if you have a wait at the DIA try the Chop House for a meal and atmosphere that will put a very nice end to your trip! For a lot of people, Steamboat Springs means skiing, hot chocolate, and winter fun. And in their defense, the skiing truly is fantastic – and kids ski for free! 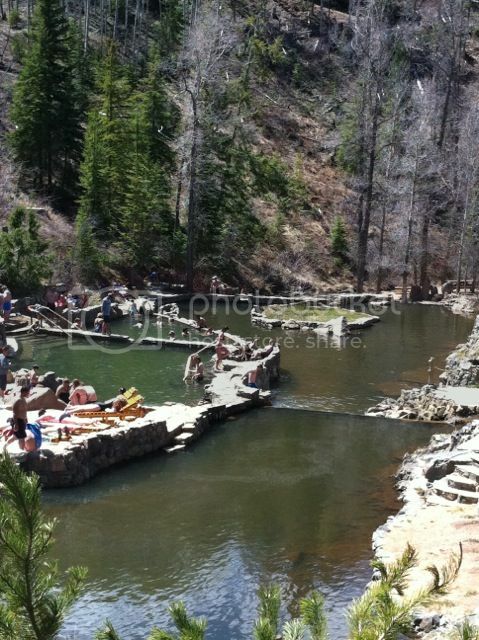 But for the select few that have had the privilege to experience the hot springs, that’s where the real magic is. The hot springs were actually what gave Steamboat Springs its name – before construction quieted the springs, they made noises like a steamboat coming down the river. We really wanted to take advantage of the Hot Springs during our stay in Steamboat, and had two very different options to take try while we were there. 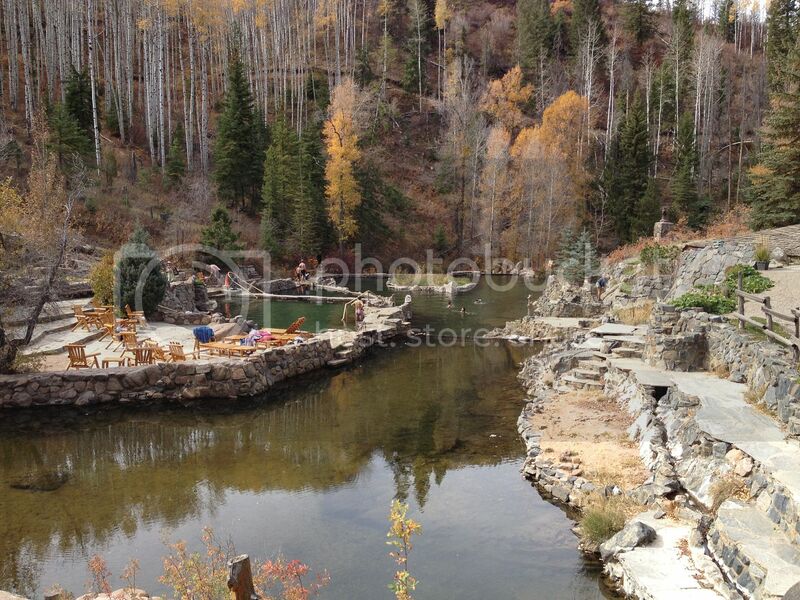 The larger of the two springs is the Old Town Hot Springs in the Steamboat Springs Health and Recreation Center. Located in the heart of downtown, the facility is open to the public and features eight hot springs pools. This is a great kid-friendly option, with water slides, climbing features, and more of a “water-park” feel. There is also a locker room, snack bar and fitness center, which makes it easy to change and store all of your stuff. My personal favorite, however, was the Strawberry Park Springs. About seven miles from downtown Steamboat, the Strawberry Park Springs are a little bit smaller, and significantly more rustic. I would recommend scheduling a massage during your time that you spend there – the hot springs will only enhance the benefits. Strawberry Park Springs seeks to place an emphasis on the beauty of the natural surroundings, and as a result there is limited heat and electricity on the property. If you plan to go at night, pack a flashlight! You won’t be able to enjoy the mountain scenery, but the stars are amazing. Back in town, I was pleasantly surprised to discover the quality of the restaurants and service in Steamboat. Steamboat in general is an incredibly friendly place, but the quality of the staff was better then I have experienced anywhere else. We ate out most nights – some of our favorites included the Mahogany Ridge Brewery and Grille, Mazzola’s Italian Restaurant & Lounge and the Bistro CV. At the end of the day, it was a pleasure to return back to the Cimarron Chalet. The Chalet was the perfect place to enjoy family time- big enough that we were able to be close, without feeling crowded. And on top of that, the concierge staff and amenities made it feel like we were staying in a four-star hotel. 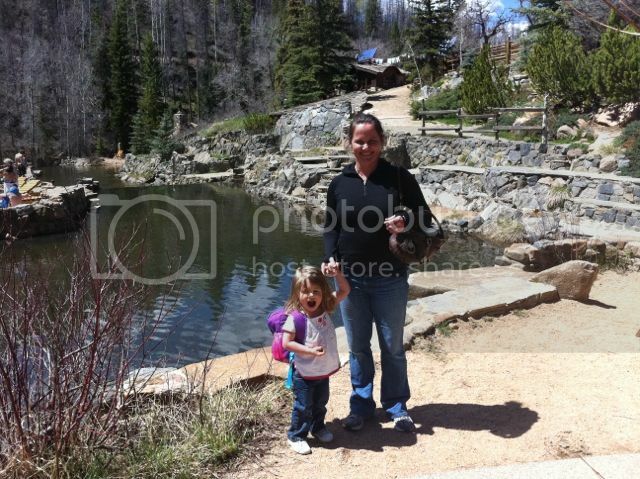 After the experience – I can’t wait to go back!